This is the beginning of week two of a month of posts by Island Batik Ambassadors featuring all of the newest collections of fabric. Today I'm sharing what I made with my bundle of Fortune Teller fabric. Way back in July I was so excited to open this beautiful rainbow of fabric. My quilt features all 20 fabrics from the collection and is 80" x 96"! I think that makes it one of the three largest quilts I've made. I optimized for using all I had of the twelve fabrics that make up the center of the quilt and didn't really think about just how big it was going to be, how much binding that would take, or how hard it would be to hold up. I just love the bold colors and couldn't resist making a rainbow. The triangles features all the multicolor prints from the collection. 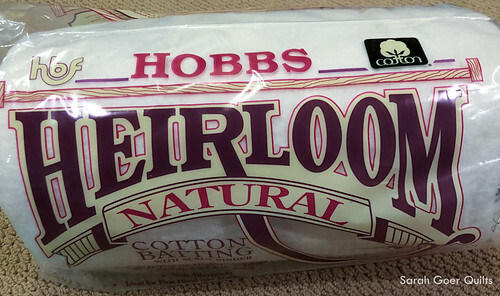 The other part of my optimization was that I had a queen sized Hobbs Heirloom cotton batting. Thank you, Hobbs! Once it was pieced, I visited a local quilt shop to longarm quilt it myself. I chose a motif that would offer great texture without being too dense. I like that this one is quilted in rows, but that each row kind of nests with the row above it. I used my machine binding technique to attach the nearly 30 feet of binding. The binding is Rice. I like that the color reminds me of clouds... fitting for a rainbow quilt. 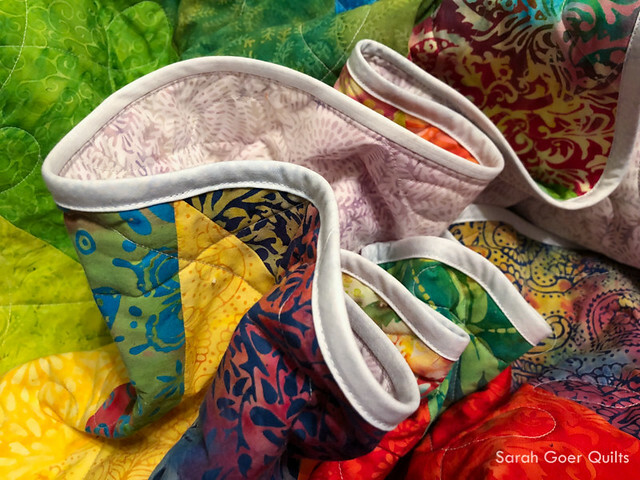 SARAH GOER QUILTS GIVEAWAY (US Residents Only) GIVEAWAY HAS ENDED. For your chance to win a Mystery Bundle of Island Batik fabric, enter with Rafflecopter below by leaving a comment on this blog post and tell me your favorite color(s) and/or by being a newsletter subscriber. Not a newsletter subscriber yet? Subscribe here, click to confirm your subscription in the email that comes to you. At the end of the giveaway I will email the randomly selected winner and they will have 48 hours to reply to claim their prize or I will select a new winner. The Mystery Fabric Bundle will be mailed to the winner. Thank you for visiting! 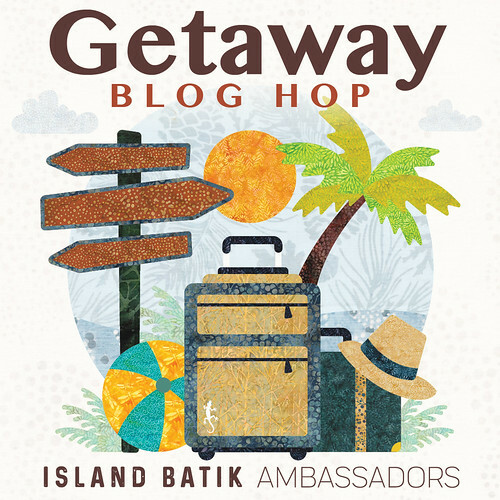 Don't miss out on entering the great giveaways on many stops of the Island Batik Getaway! And Island Batik is giving away A Rainbow of 20 Fat Quarters of Island Batik fabric. Island Batik Getaway Blog Hop Schedule The Great Outdoors Blog Hop with Island Batik Island Batik Unboxing Island Batik Ambassador 2018: Fabric and Thread and Batting, Oh My! Posted in Quilting. 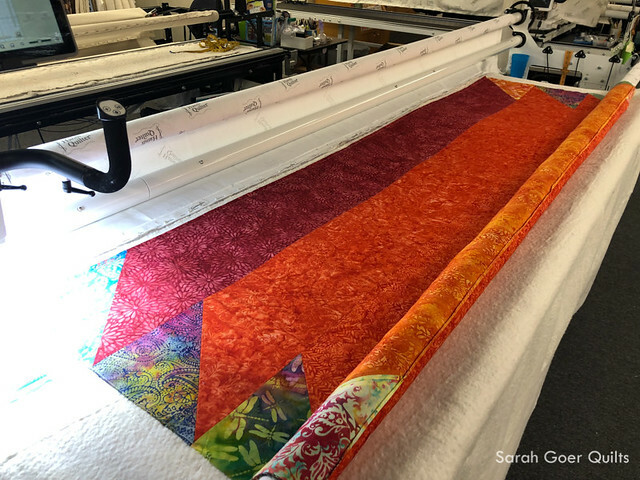 Tags: blog hop, finished quilt, free motion quilting, Getaway Blog Hop, Island Batik, Island Batik Ambassador, longarm quilting, queen quilt on January 14, 2019 by sarah. My favorite colors are blues and greens. And I am always drawn to bright colors, so I think your quilt is beautiful! Sarah, this quilt is amazing. The colors are so rich and luxurious. The design is simple yet playful and appealing. I love how you quilted it also. Thank you, Gene. I love full saturated, bright colors. Beautiful quilt and beautiful fabrics. I love the way you quilted it. Thank you for the giveaway. My favorite color is green. What a beautiful quilt - love the colors. My favorite color is purple, but I haven't made a quilt with purple in it! In quilting my favorite color is teal. Teal is one of my favorites for quilting. I love teal, navy, and lime together. I tend to have all purple or no purple quilts, despite purple being a long time favorite. Maybe I just love color in general now. :-) Thanks for visiting, Diantha. Wow! That's one big quilt! I love the rainbow colors. I think my favorite color must be red, since my car, my phone, and my computer are all red. Signs point to red! I wish my minivan was purple. :-) Thanks for visiting, Allison. So many wonderful blues to choose from! Thank you for visiting, Linda. Green is my favorite because it goes with just about everything. Way back when I was an avid scrapbooker I learned that blue and green were easiest to use with all photos... I think because they appear so much in nature. Thank you for visiting, Kathie. Yay, Sarah! I love your rainbow quilt! Congratulations. Once you're in the big quilt mode, it's hard to make anything smaller than a full-size quilt! Thank you, Alice. I may bounce back to little (well, medium?) quilt mode. Though I do have some WIPs I'd like to finish this year that are larger. I totally get that "for now" part! Thanks for visiting, Janet. Wow, I can imagine how much fun it will be for your family to use a supersized rainbow for a fort! The Lost Boys and My Little Pony never had it so good. And my favorite colors are any shade of blue, lime and emerald, fuchsia, purple and orange. Quilts being used as forts is one of my favorite uses! Candy Shoppe with the mostly white backing has a stained glass effect when used for a fort. Love it! Except for the orange, that list of colors makes me think of peacocks. Such rich, beautiful color. Thanks for visiting, Amy. Beautiful quilt! My favorite colors are all of them! 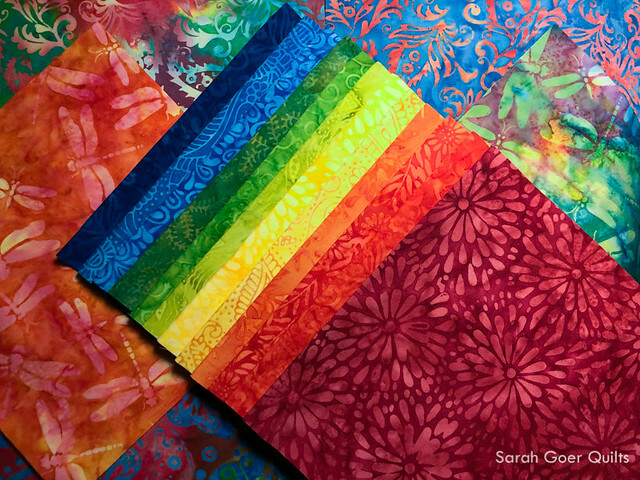 :) I especially love bright colors like the fabrics in your quilt. 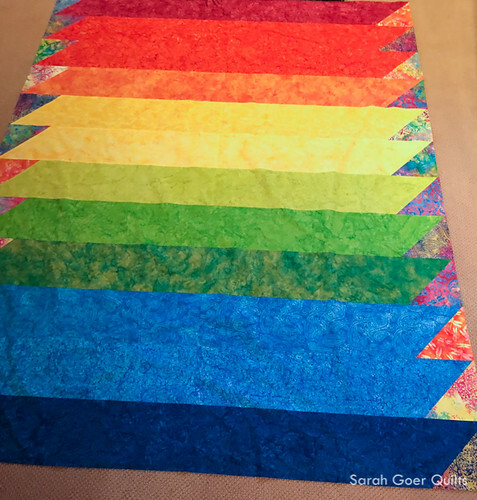 Your rainbow is gorgeous and I really like the quilting! My favorite color is blue. Thank you, Debra. The quilting motif was very forgiving. I just focused on the height of each row as I quilted it and nesting between the loops of the row above... if you look closely my loops are a variety of sizes and the width between loops varies, but it works! I'll definitely use this one again. My favorite colors are Purple, Blue and Lime! Your quilt is happy! Thank you, Melody. That's my favorite half of the rainbow, too! I'm also a subscriber to your newsletter- so enjoyed! 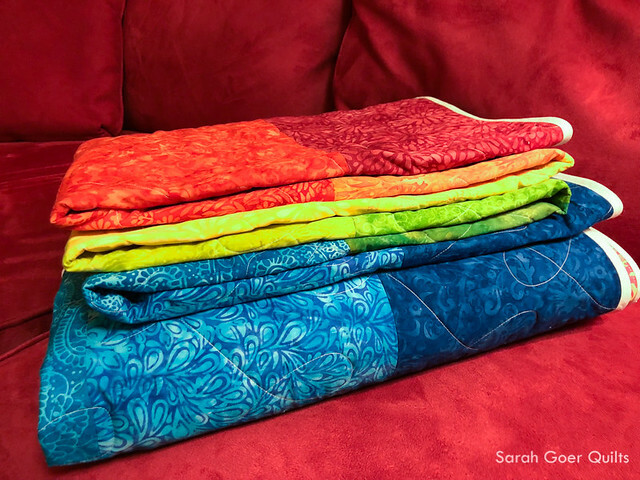 What a beautiful rainbow bundle of fabric and an awesome quilt finish. 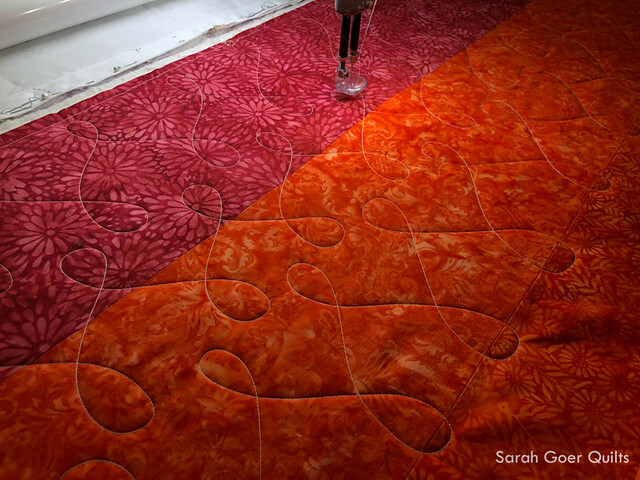 The quilting motif looks great; how long did it take to quilt a larger quilt on the longarm? Wow, I finally figured out how to comment on this post!! The comment button wasn't showing up when I clicked the link to get here...but if I click the link on the right side of your blog...there it is!! Love your rainbow quilt...it will make a lovely snuggle on these cold winter days/nights! My favorite colors are teal, green, purple...I guess I like the "cool" side of life!! The main page of my blog currently shows the three most recent blog posts, but you'd have to click on the title of the post to get to the post page (or how you clicked on the sidebar works too)... or once I've approved comments then it lists the number of comments next to the title and you can click on that. Sorry for the confusion. Thanks for sticking with it until you found the comment field. I'm a cool color lover, too. Thanks for visiting, Susan. WOW! It is so much fun to see the different ways people show off their collection. This is so you and looks splendid. The quilting is just perfect - now off to make my quilting plan. Orange/yellow and purple are my favorite colors. The rainbow colors would be follow them. I love browns, oranges, blues and greens. Your quilt is a great way to show off lovely fabrics! My favorite colors are purple and black. What a great quilt to snuggle the winter blues away! Love the simplicity of it. Thank you, Jennifer. I may make it again in a smaller size. forgot to tell you that my favorite colors are in the warm range of autumn colors. I love the dark greens and muted oranges and golds with a bright spark of purple thrown in. Those are definitely colors that make me think of Fall. Reminds me of the colors in my Jungle Cabin quilt. 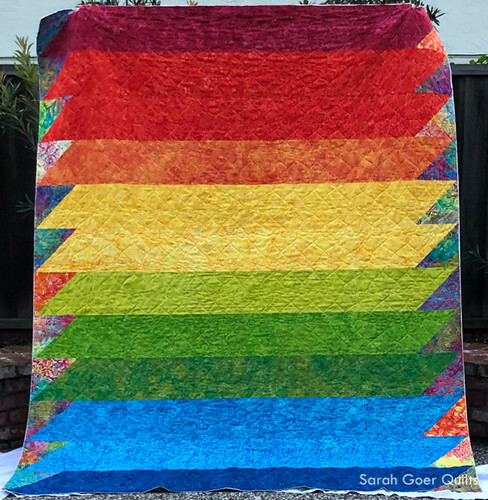 What a gorgeous rainbow quilt, love it! My favorite color seems to be in the rose and fuschia colors--but I also love some beautiful deep blues! I am in love with the colors. My favorite quilt color is blue but I like bright. Your quilt is great. Thank you, Carla. Purple is my favorite too. Not much of it in this quilt. When I was considering binding options, I asked y 6-year-old daughter what she thought I should use for binding. She immediately declared I should use purple because it was missing from my rainbow. I loved her thinking, but opted for a neutral. If I'd had enough purple fabric on hand I may have gone for it. Oh wow, what a great rainbow! Such fabulous fabrics and a really fun design. I love the multi-colored triangles. And the quilting design is so perfect, wishbones & rainbows. Enjoy!!! My favorite color is red. However, I love all bright colors. Your quilt is awesome with all of the bright happy colors. My favorite colors are pink and blue. That sounds lovely. Thanks for visiting, Sandy. I love your quilt. It is gorgeous. My favorite color is purple, but really I love all colors. Thank you, Lori! Purple is my favorite, too. Love the colors in this collection and what you made with it! I always have a hard time deciding a favorite color but I guess I would say maroon. Maroon was my high school's color, so I have a special affection for it. :-) Thanks for visiting, Teri. A gorgeous quilt and such rich colors! My favorite color is blue. I especially like the quilting design you chose--saw it for the first time earlier today and have it in my online cart. Thank you, Verna. I was inspired by another quilter using it. I think I've also seen it quilting in a pantograph. My favorite color is purple, but I love working with all bright colors. I love your quilt. I'm on exactly the same page! Thank you, Pam. I love navy blue, purples and greys! Your quilt is beautiful! Thank you, Lee. Do you like them all together? That sounds like a lovely palette for a quilt. The quilt is beautiful, and all of the colors are beautiful! Those blues really jump out! Love your bold approach to this quilt! My favorite colors are teal/turquoise and coral, but I am trying to branch out. What a beautiful quilt. I love the rainbow of colours. I must admit my favourite color is purple with a bright blue being my second choice. Thanks for the inspiration. 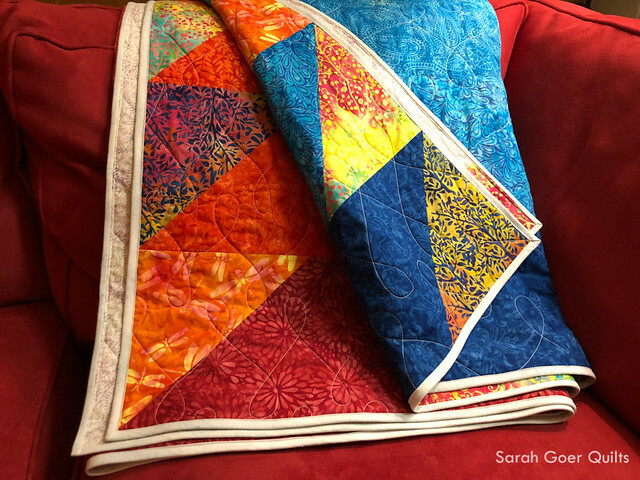 Beautiful quilt Sarah and a great way to showcase the fabrics! My favorite colors are blue and purple. Can't get enough of them. Thank you for your give-away. Blue and purple offer many varieties. Thank you for visiting, Lynne. This is beautiful! I love a good rainbow. This will make an AWESOME fort!!!! Thank you, Emily. I agree! Hi Sarah I don't live in the States but I can give you an address to mail the bundle to. My favourite colour is blue and there are lots of other colours that go with blue like your favourite purple. There are such a beautiful array of blues to choose from. Thanks for visiting, Lisa. I love all bright colors, but especially purple in every and any shade! Me too, Kathy! There are so many great purples! It looks great! Great use of all the prints. That's a great quilting motif. Well done. As you know, orange is my favourite colour. It was a bold decision when I bought it, but I love having a red couch. Thanks for visiting, Beth. 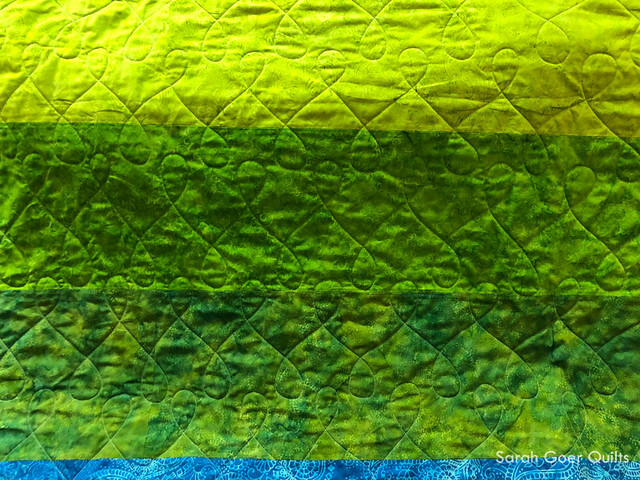 I usually gravitate towards teals but I’m currently working on a bright, batik rainbow quilt and I’m loving it! I love your design, such a great way to showcase these beautiful fabrics! My favorite colors are green and purple. I love your rainbow quilt! It will be the focal point of whatever room it lives in! I also like your Project Quilting entry. Green is a wonderful color for hope! Thanks for sharing your beautiful work. Thank you so much, Pam. I love greens and purples together. My favorite color seems to change often. Today it is yellow and reds. I have several quilts for grandkids to build forts too. Fort building quilts are important! There are too many wonderful colors to choose from. Thanks for visiting, Vicki. Gorgeous use of the collection, and I love purple. Great job! I wish I had a quilt shop nearby that rented time on a LA. Thank you, Maryellen. The shop isn't super conveniently located, but I'm happy that it's an option. Tropical colors are my favorite for sure. Often I start with the cool colors and then add warm colors for sparkle. I lean toward cool colors in general, but you're right about how a warm color adds a sparkle! Thanks for visiting, Ellee! Your quilt is beautiful and I love the quilting. My favorite color to quilt is green. Thank you for this giveaway. Always fun to try to win. I like the rainbow colors as well, I often use them in "I Spy" quilts along with novelty prints. I think blue is my favorite color. Your rainbow quilt is so cheery that it is sure to bring a smile even on a cloudy day. Great design that shows off the fabrics. I especially love blue and turquoise. I love the whole Rainbow! :-) Thanks for visiting, Anita. Sarah, when your page opened and I saw all those beautiful, bright, colorful and luscious fabrics, I was soooooo happy. Isn't it amazing how color can change uplift your spirits, even when you haven't sun in several days? Aww. Thank you so much, Sylvia. It's pretty dreary here today. I totally agree that color can be a mood booster! While I will always love anything in the Blue Family, I will always love any color combo that makes me smile!! These colors are definitely "smile" colors! I love purple! Thanks for participating with Island Batik, your quilt is beautiful! I don't have favorite colors--I love bright colors! I love the brights, too! Thank you for visiting, Judy. Thank you, Judi. And I love the speed of machine binding. I've shared my technique on my blog in this post. My favorite color is blue! Beautiful, colorful quilt you created! Enjoy your day! 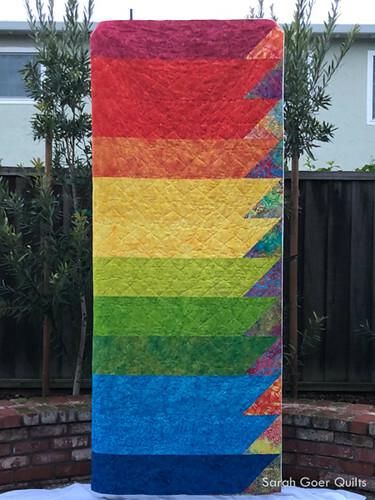 This rainbow quilt is Glorious! What a huge quilt, and one can't help but smile when you see it. My favorite colors are shades of violets, lavender, and purple. Thank you for visiting, Sharon. Favorite color is red, but I like most all colors. Thank you, Leanne. I will use this free motion motif again. All shades of blue are my favorite colors. I have also recently developed a love of bright colors! Welcome to the bright color club! :-) Thanks for visiting, Nicole. Beautiful quilt. I love deep, rich colors. Blues and greens are my favorites. Great palette! Thanks for visiting, Connie. I love all brights, but my favorite colors are blues and greens. The batiks are beautiful. Thanks for the giveaway. Than you for visiting, Pat. All colors have a place in nature and by extension they have a place in my stash and, eventually, my quilts. (Not all at once, of course.) Your batik bundle is delicious. Thanks for the giveaway opportunity. 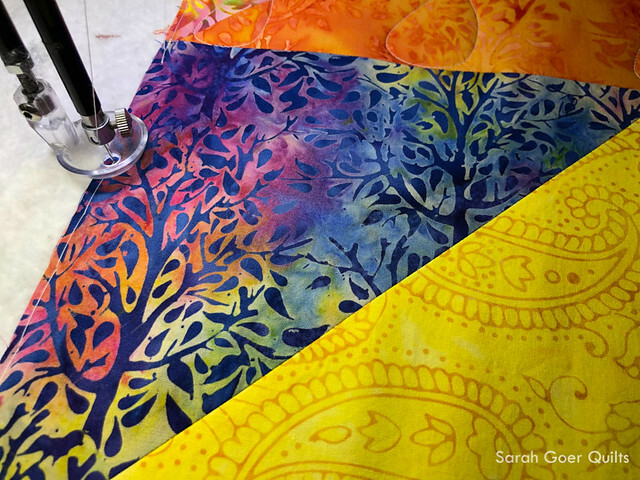 Love the batiks you used for your quilt. Beautiful quilt and perfect quilting design for the pattern. Thanks for sharing. oh...btw...my favorite color is any shade of turquoise/aqua. Thank you, Becky! I love turquoise, too! Your quilt is striking, the colors just pop with that design. My favorite color is purple. The odd thing is that my stash is not heavy on purple, blues and greens have that honor. This blog hop is so inspiring. Thank you for sharing your quilt. Thank you, Deb. I do have a fair amount of purple fabric, but blues and greens dominate my stash as well. Jades, teals, mauves, pinks and blue toned reds are my very favorite colors, but I really enjoy all blue toned colors. They are more "me" than the yellow toned ones, but they are all beautiful. 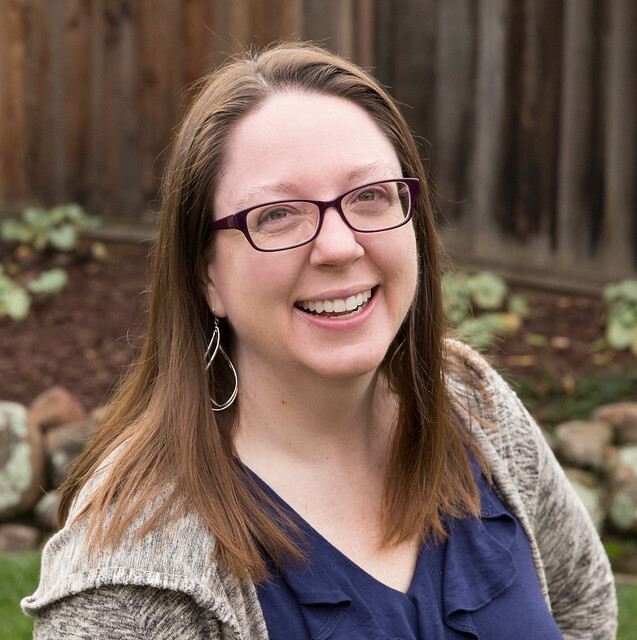 Looking forward to following your blog and this blog hop is my first. It's very interesting! Having a blast so far! Thank you for visiting, Teckla. My favorites are purples, turquoise, lime green, and pinks! Most of the colors of your quilt!! Great job! My favorite colors are purple and turquoise. Those are good ones! Thank you for visiting, Bonnie. Hello Sarah! I love how all those bright colors work together! I used to make more subdued colored quilts, but since I started using brighter colors I love how it just makes them pop more! I have always loved blues and greens in quilts, but putting oranges in them just makes them seem more happy and fun to cuddle up in! Orange is a great addition to blues and greens. Thanks for visiting, Barbara. I love your project. You really showed off your fabrics well. Thank you, Jennifer. I'm really happy with the color blocking. What a rainbow! This really shows off the lovely vibrant colors in that collection. Beautiful! Thank you, Jennifer. Vibrant colors are my favorites! A large drink of rainbow colors, so cheerful and bright. I love all colors as I have been sewing and creating for many years and have used or admired just about every color. My favorite color is teal, no blue, no green, purple. I just can’t decide. I prefer using bright batiks like the one in your cheerful rainbow. That half of the rainbow is my favorite, too! Thank you for visiting, Suellen. Lovely! I love rainbow colors and you have done a great job of showcasing the fabrics. Beautiful! Beautiful quilt! Love the colors. I find myself going for purples and pinks, if I am making anything for my daughter. Hi, Great quilt! My favorite color is blue, all shades, currently leaning towards blue-teal. Thank you, Robin. I love teal, too! I favorite colors are blue and black. It is a fun quilt and I have to review your machine binding technique.